In Quest of the Mythical Mate Kit. Develop Your Counseling Skills, Get Better Results and Build Your Practice. A complete kit of Couples Therapist practice building supplies! This is a comprehensive roadmap for how to enter and transform the couple’s world of rage, turmoil, and despair. You’ll hone in on how to navigate the toughest situations, so you can move from feeling insecure and unclear to rock steady confident in what decisions and interventions to make. You’ll feel much more like a sure footed guide as you usher your clients from being painfully stuck to creating lasting breakthroughs. 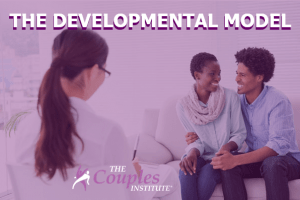 If your graduate training only superficially covered couples therapy, as most programs do, you probably feel insecure in many of your sessions. To get deeper learning using the Developmental Model developed by Pete and Ellyn, you might also be interested in learning more about The Developmental Model Program. While we only open the program up a couple of times per year, you can learn more about it here (and sign up for the waiting list).